SAN DIEGO – While C.J. Wilson’s name began circulating in trade rumors on social media and in the lobby at baseball’s winter meetings, apparently that talk didn’t make it up to Jerry Dipoto’s suite. Certainly, this could be a matter of semantics. Trade discussions take different forms and begin at different levels of the front office. Whether or not there has been any discussion about trading Wilson by the Angels or by other clubs, Dipoto left little doubt that he has confidence in the left-hander. Because of Garrett Richards’ injury – the Angels expect him back sometime in April – and Nick Tropeano’s inexperience, the Angels couldn’t move Wilson without getting a replacement. That replacement would have to come on the free agent market. A pitcher who would definitely be an upgrade over Wilson would likely cost more than Wilson. In order to make that work, the Angels would need another club to take virtually all of the $38 million he’s owed over the next two seasons. Coming off Wilson’s worst season, that’s not likely to happen. Of course, that statement still isn’t likely to quash the speculation, because the Angels signed Albert Pujols and Josh Hamilton in 2011 and 2012 without a public clue they were pursuing either. Dipoto understands how those deals have left the public skeptical of his denials. The Angels claimed left-handed hitter Marc Krauss on waivers from the Houston Astros, giving them a potential left-handed bat off the bench and part-time DH. Krauss, 27, can play first base and both corner outfield spots. He also saw time with the Astros as a designated hitter. The Angels will give him a shot to share DH at-bats with C.J. Cron, who Dipoto said will get the “primary bulk” of the action. Krauss also has options, so he can shuttle between the majors and Triple-A. Krauss has a career .200 average with 10 homers in 354 plate appearances over the last two years in the majors. Krauss is a career .278 hitter with an .854 OPS in the minors. He hit .289 with an .834 OPS at Triple-A last season. Dipoto saw Krauss play at Ohio University before drafting him with the Arizona Diamondbacks in 2009. Krauss was traded to the Astros in July 2012. The Angels are not expected to fill their utility infield hole during the winter meetings, and perhaps not until January. Their first choice is to re-sign Gordon Beckham, but Beckham is expected to need some time to determine if he has an offer elsewhere for more playing time and more money. If the Angels don’t re-sign Beckham, they are likely to look to trade for an infielder rather than signing a free agent. Among the infielders who would make the most sense for the Angels are Detroit’s Eugenio Suarez, St. Louis’ Pete Kozma, Colorado’s Josh Rutledge and Houston’s Marwin Gonzalez. Kozma and Gonzalez are likely the most available of that group, but the Astros may be a better fit because they need the relief pitching the Angels have to spare. 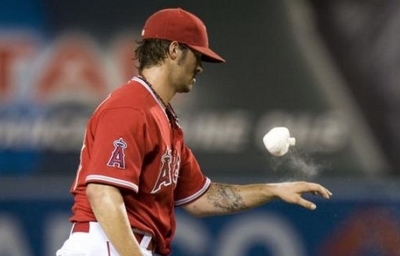 The Angels could trade someone like Vinnie Pestano or Fernando Salas to the Astros. The Cardinals are believed to be more interested in a prospect with some upside, and the Angels don’t have many of those to spare. Major League Baseball’s PR directors announced an initiative to raise money for Lungevity, a foundation dedicated to research and treatment for lung cancer. Major league clubs are auctioning memorabilia and experiences. For more information on the Angels-related items, see the Angels official website, angels.com.